The best commentators on the great J.R.R. 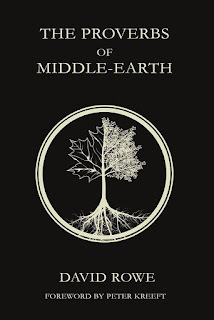 Tolkien's legendarium of Middle-earth cause you to return to The Hobbit and The Lord of the Rings with a newfound ability to detect something you had previously overlooked and in this way help you find greater enjoyment in Tolkien's works. David Rowe is just such a commentator. Clearly the fruit of a great erudition and of a devoted love, Rowe's recently released The Proverbs of Middle-earth (Oloris Publishing, 2016 [$18.00, 234 pages]), masterfully explores the "more than four hundred proverbial sayings" placed on the lips of the peoples of Middle-earth by the Professor (63). By deeply delving into the profundity of dwarves, elves, ents, men, and hobbits, Rowe uncovers for us a great treasure, helps us understand each of these races from within, as it were, and in the process helps us understand ourselves in a clearer light. In his brief forward to this book, Dr. Peter Kreeft says he is "as pleased as a pickle that I was sent this wonderfully Socratic book" (v), a book that "is really an act of anthropology" (iv). Whenever you find an enthusiastic endorsement from Dr. Kreeft, you know you are in for a treat, and this book is no exception! What we quickly discover is that Tolkien did not merely create hundreds of erudite, apposite, and funny sayings - however great an artistic achievement that is - he also invented entire wisdom traditions in which these sayings belong. Just as different contemporary nations often have contrasting perspectives, so each civilisation of Middle-earth has a distinct worldview or philosophical culture. Each of these becomes apparent when we look through the lens of their proverbs: the national character and philosophy of each of Tolkien's cultures - from the small-minded pragmatism of rustic Hobbits tot he disciplined dignity of Gondor - has been written into their wisdom traditions. Tolkien's legendarium is founded on details such as these; its world created from the bottom-up, and therefore richly rewarding to those who take the time to dive in and investigate the depths (xiii). Of particular delight, are two of Rowe's three appendices in which he lists the proverbs (and those who speak them) in The Hobbit, The Lord of the Rings, and the appendices to The Lord of the Rings, first in chronological order and second by the peoples of Middle-earth. I would provide you with summaries of his explorations of the proverbs of each of the peoples of Middle-earth, but I do not wish to rob you of the joy of discovery that comes with the reading the chapters without quite knowing what to expect. Let me simply say that in The Proverbs of Middle-earth, Rowe brilliantly shines a light on an important aspect of Tolkien's writings hitherto largely unexplored. He helps us to see that "in the well-feigned history of Middle-earth, what is offered to us is wisdom and truth: not a simple lesson to learn, but over seven thousand years' worth of learned lessons to apply" (174). As he leads us through these learned lessons, Rowe takes us by the hand and guides us along the paths of wisdom and truth and opens for us a new and unexpected adventure.